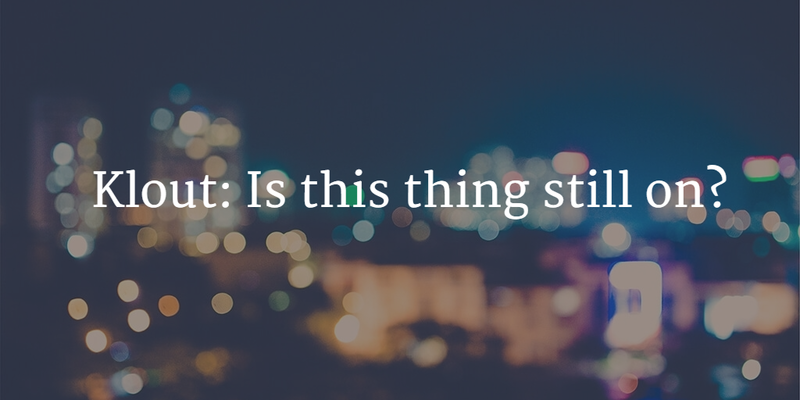 Klout: is this thing still on? Are Klout scores still relevant? » Are Klout scores still relevant? Are Klout scores still relevant? Are Klout scores still relevant? Ketchum’s global engagement officer asked 13 executives, planners and strategists in his network how they rated Klout as a tool for identifying and measuring influence. I was one of the Bakers’ Dozen. Do you check your Klout score before getting out of bed each morning? No? Me either. So I was intrigued when Stephen Waddington, Partner and global engagement officer at Ketchum sent me a Direct Message Tweet asking for my comments on the use of Klout as a metric tool for social web influence. The idea of an official social media scoreboard is enticing. As we live more and more of our lives online a measure of our social footprint and impact seems, on the surface, a good idea. Especially when we can track our scores against those of our peers’ to see who has the most social relevance. Klout’s 1-100 score also fits snuggly with the quantified self. Increasingly we measure the length and quality of our sleep. How many steps we walk each day. Why wouldn’t we want to track our social reach? The problem with Klout is that it’s bunkum. The topics include FIFA and Smartphones. I know NOTHING about football and, save for believing that FIFA’s management falls far short of passing the smell test, I know nothing about this governing body either. To say that I am an expert in Smartphones is absurd, too. I have a smartphone. That certainly doesn’t make me an expert. I’m a firm believer that in the social age there’s no longer a separation of the personal from the professional. Our online lives are not distinct from our day-to-day lives. Both ebb and flow into one fully-rounded self. The most fundamental virtues and principles in private and in public are in fact the same. Life is a whole and must be approached as such. That said, we also use different platforms to engage with people from different parts of our lives. A case in point: my biggest score impact on Klout over past 90 days came from one of those Facebook shared memories. 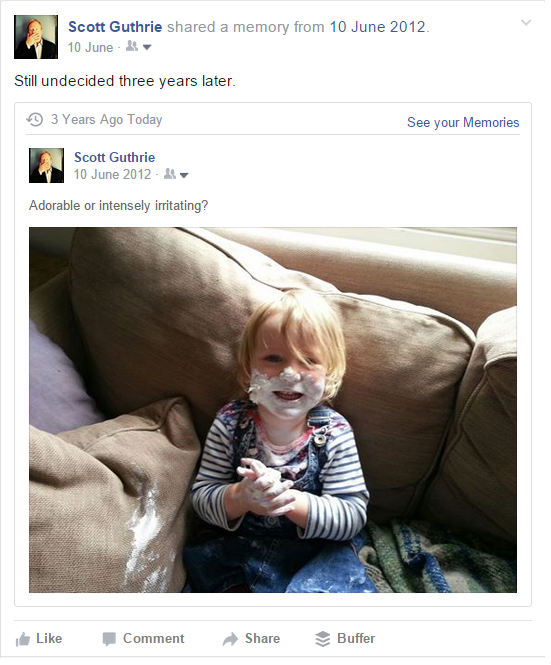 Resurfacing a photo taken three years’ ago of my daughter covered in Sudocrem. Based on that I should probably jack in the sometimes intellectually-draining pursuit of writing articles for my blog as well as guest posts and embrace the cult of the frivolous. Posting only ‘like-bait’ photos of my kids on Facebook instead. And ensuring every Tweet I write includes the hashtag #contentmarketing. I’ve noticed this hashtag attracts a lot of automation. My Tweets are favourited and retweeted automatically by several corporate and personal Twitter handles whenever this hashtag is used – so swelling my Klout score. Are Klout scores still relevant? In short, Klout doesn’t work because it’s easily gamed and includes a broad-based measure on seven social media networks which we all use differently to participate in conversations with different factions of our lives. 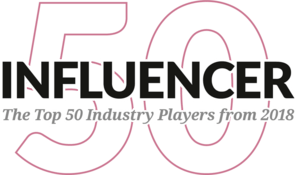 In total Stephen asked 13 executives, planners and strategists in his network how they rated Klout as a tool for identifying and measuring influence. Many of these individuals, like him, were named in the Brand Republic list of the most influential people in advertising and marketing on social media in the UK earlier in the week. 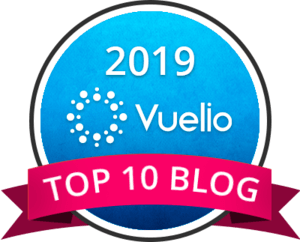 You can read Stephen’s article here which includes his keen insights along with those of from his network. BrandRepublic has now republished Stephen’s article in full. You can read it here.